Is rice pudding part of the comfort-food craze? 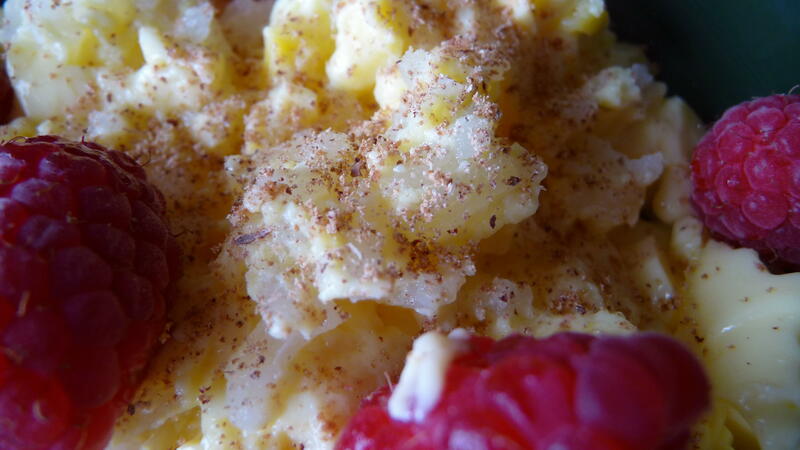 I have not noticed rice pudding nearly as often on menus, in cookbooks, or in the blogosphere as bread pudding. Perhaps it is the snob appeal of using brioche, quality challah, or other artisan breads in bread pudding. The rice pudding from my late grandmother’s recently discovered files, however, is a classic dish of comfort fare. 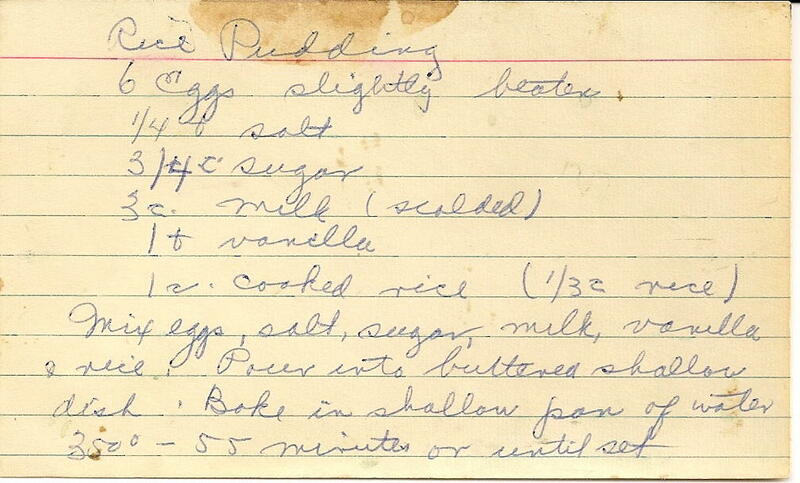 I distinctly remember my grandmother’s rice pudding, so I was looking forward to making this recipe. Rice pudding is a dessert I enjoy and will make, depending on leftover rice, mood, and other competing dessert priorities. 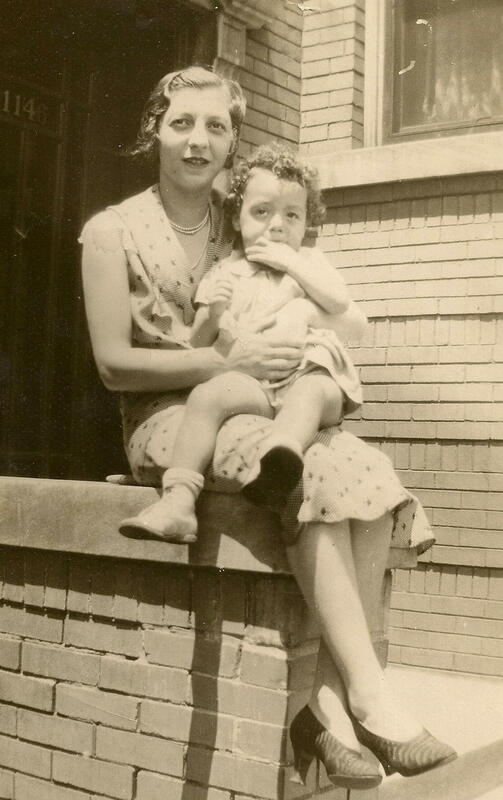 In 1931 Jessie (with my mother Nat) might have made rice pudding as a Depression-era dessert. Last time I had made rice pudding, I followed Rick Bayless’s recipe for his Mexican version with cinnamon and lime, Arroz Con Leche, for my Olympic kick-off party (my theme was dishes from Olympic hosts of the past 50 years – Mexico had hosted the 1968 summer Olympics, and I needed to do something with the four egg yolks leftover from my lemon meringue cookies – a nod to Grenoble, host of the 1968 Winter Olympics). The Bayless recipe is worth a try for a softer, very cinnamony, lime-zesty pudding. Getting back to Jessie’s baked rice pudding, I think this is a superb rendition for those of you who really like baked custard and lighter-on-the-rice examples of the dessert. 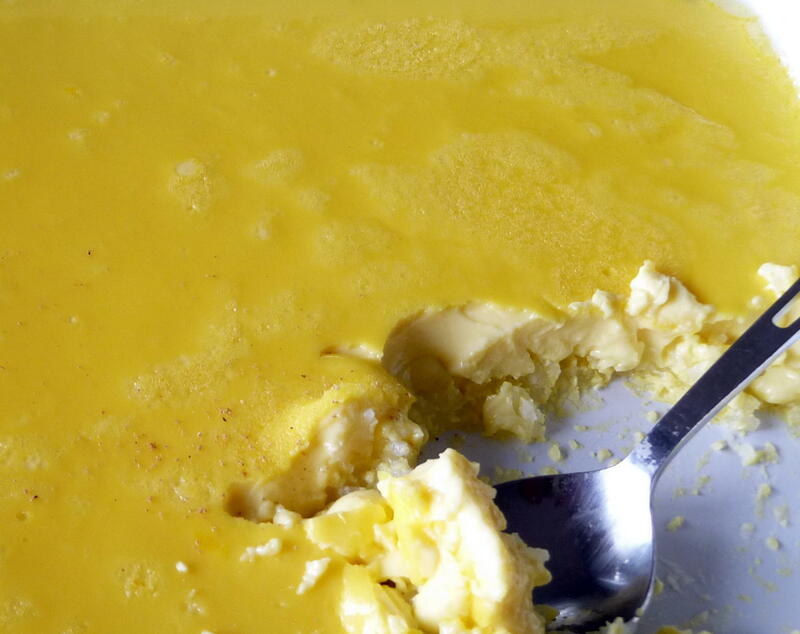 The custard is fairly rich (six eggs and three cups of milk), though the dish is not overly sweet. This is an elegant rice pudding, which perfectly would cap-off a comfort-food dinner party (a mixed green salad and daube de boeuf, for instance) or lunch (home-made tomato soup and freshly baked bread) or even a brunch or breakfast, for that matter, if you consider what goes into Rice Krispies and omelets – these ingredients would be comparable and probably more wholesome! The eggs I had on hand were from happy free-range island chickens – available in a big Coleman cooler, to be purchased on the honour system – just up our road. I have noticed that these eggs tend to be extra-large or large. 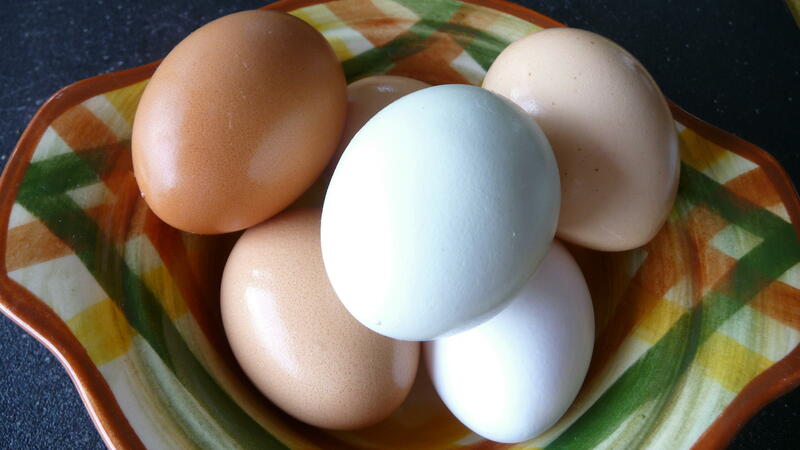 The egg cartons cost $4/dozen and always contain a hodge-podge of many different chicken breeds, with tan, mocha, white, and pale blue-green shells. 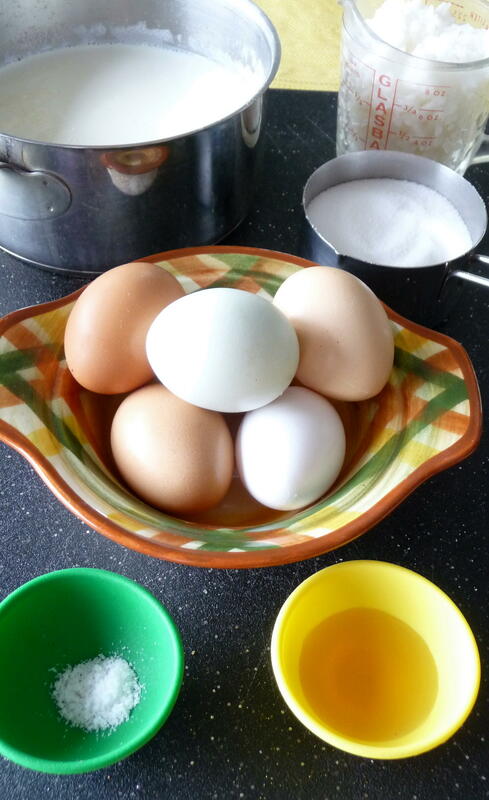 I do wonder if the larger eggs I had might have resulted in a firmer custard than I recall (certainly mine was a deeper yellow, based on the island-chickens’ rich diet) or whether it is an issue of memories varying from reality, once again. I remember that my grandmother grated nutmeg on top, so I included that, even if she did not have it specified on the recipe card. While I know Jessie used “Uncle Ben’s Converted Rice” – from what religion it converted, I know not – I used my standard white rice, Thai Hom Mali ( jasmine rice). The jasmine fragrance provided a delicate counterpoint to the nutmeg. Comfort food trends aside, I believe this rice pudding is a retro classic worth making again. 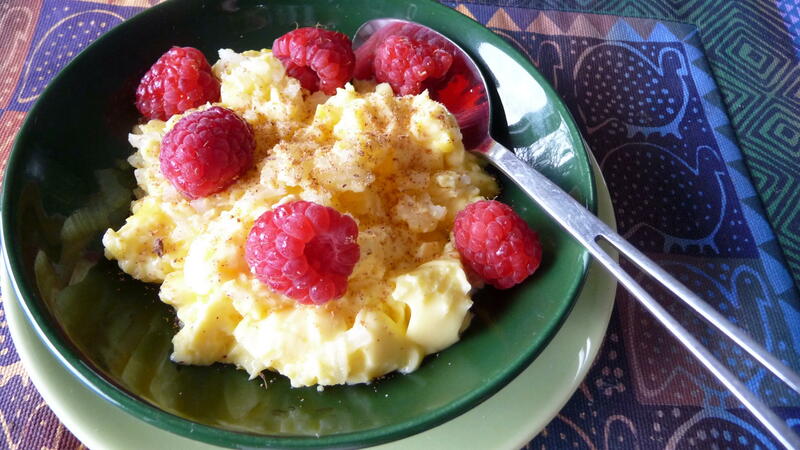 Fresh BC raspberries and grated nutmeg complement the rice pudding. Pour into a greased oven-proof dish. Place dish into larger pan filled with very hot (or boiling water) for the full bain marie treatment. Bake for 55 minutes or until set (a knife inserted will cut a firm edge, which holds its shape, in the custard). Serve warm, at room temperature, or chilled, depending on your preference and mood. Berries or whipped cream couldn’t hurt, either. This entry was posted in Baking, Dessert, Recipes Misc, What Would Jessie Dish and tagged Island life, pudding, Retro, Rice, Vintage Recipes. Bookmark the permalink. Interesting! I’ve only ever used pudding rice (similar to risotto rice) for rice puddings and Jasmine rice for, er, regular rice. Good to know that you can make awesome rice puddings with Jasmine, though (or Uncle Ben’s in J’s case…)! Good question. Unfortunately it’s only ever referred to as ‘pudding rice’, even in shops. It’s probably closer to canaroli than arborio, however, as arborio is very much the ‘risotto rice’. I shall investigate for you and see if I can’t distinguish further than ‘pudding rice’. I love looking at your grandma’s b&w photos. 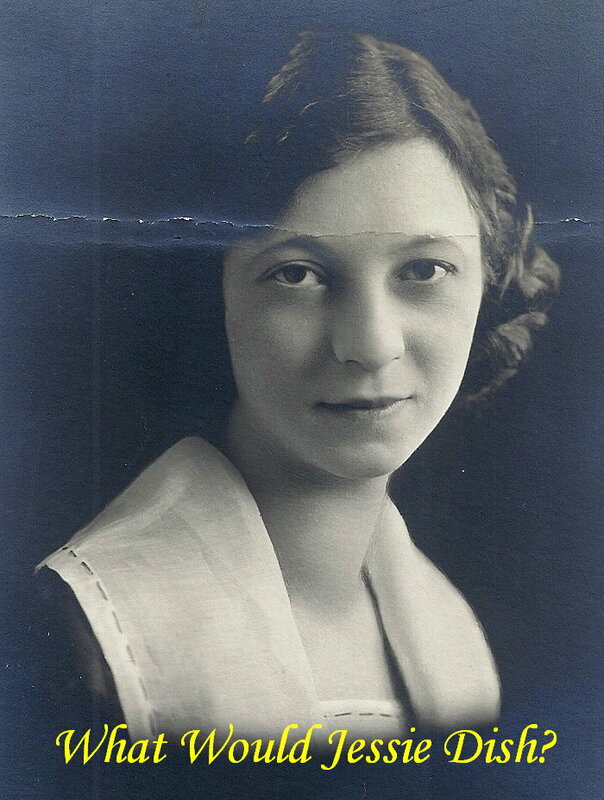 I used to be a garage sale junkie back home and I’ve managed to build a small of collection of b&w photos of other people’s grandparents. I know, it’s a strange thing to collect. It has always puzzled me why people dispose their old family photographs. I think most cultures have their own version of rice pudding. The Persians have this tasty saffron rice pudding that’s flavored with rosewater and cardamom that’s sprinkled with cinnamon and topped with slivers of pistachio. Thanks, KM. I had the same garage-sale addiction, though not now, as we don’t have many here on the island,fortunately. Personally, I always found it both fascinating and sad to look through family photos at such sales and flea markets. But it is nice that strangers do buy them to give them a home! I really like the Persian version you mention, and I’ve been thinking about kheer, the classic Indian interpretation. Any version in the Philippines? Thanks, Patty. I do appreciate your comments and am happy you stopped by. Try the rice pudding, especially if you are a big fan of custard! Garage sales aren’t too common here as well. And it’s also unthinkable to sell old photos of families, people here are far too sentimental and family-oriented to do such a thing. I guess that’s a good thing for me because I might not stop! As far as I know, although it’s more of a porridge, there’s one here where glutinous rice (aka ‘sticky rice’) is used with 100% pure chocolate, then you flavor it with sugar and evaporated milk since fresh milk isn’t available here. Now here’s the weird part (for me anyway and probably for most Westerners as well), it’s topped with anchovies! I usually omit this. I must say though, sticky rice and chocolate go quite well together. Thanks for the link on sticky rice and chocolate, which make sense to me. However, I find it very amusing that you “usually” omit the anchovies. So you have tried it?? As much as I like salty-sweet (e.g., pretzels and chocolate ice cream), I think I’ll reserve anchovies for pizza or pasta putanesca, due to my cultural baggage of keeping fish separate from dessert…. Hey Dan, I think rice pudding should be part of the comfort food craze. I mean it is comfort food, and it’s gluten free! So much better than bread pudding in my eyes. Jessie’s version of rice pudding does seem to be very rich and luxurious. I could see this type of food being highly valued during the depression. Hi Dan, What a great post I love the history and hand written recipe. What makes it so classic is that that hand written recipe. Love it! Thanks very much, Daniel. I am glad you liked it, and I do appreciate your comments and taking the time to visit! Yep, I’ve tried the chocolate rice porridge. I even know how to make it! Now that I mentioned it, I sort of want some, now that the rainy season is here. I’ll try almost anything as long as it doesn’t contain okra or any kind of organ meat or blood. There’s a very good reason why the words ‘offal’ and ‘awful’ sound alike! ; ) I just had snails stewed in coconut milk and chillies for lunch today. Thanks, KM. Do you add the anchovies to the champorado pudding as frosting? I completely agree about offal-awful but deep-fried okra ain’t so bad or okra in s. Asian curries and such…. ROFL @ anchovies frosting! YUCK! I just omit it altogether but usually, it’s eaten as a side dish. When the bowl is served to you, it’s usually garnished with 1-2 pieces of anchovies. I can’t get past the okra’s slimy texture. It’s one of those cringe inducing ingredients for me. Hi, again. I see that anchovies are the cultural counterpart to mint leaves or a few berries – I get it now, imagining the two crossed fish lounging on top of the bowl of rice – delicious, delicious. Once you have had good deep-fried non-slimy okra, you can overcome the aversion. Aversion be gone! Very like my mother’s rice pudding recipe. She use left over rice from Chinese take out [! ], at least 1/4 cup of raisins [so sugar can be reduced] and tops it before going into the bain-marie with ground cinnamon. A custard lover’s dream.